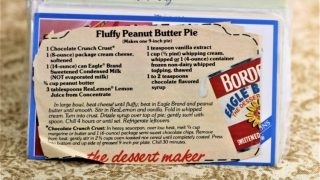 Front of the recipe card for Fluffy Peanut Butter Pie. 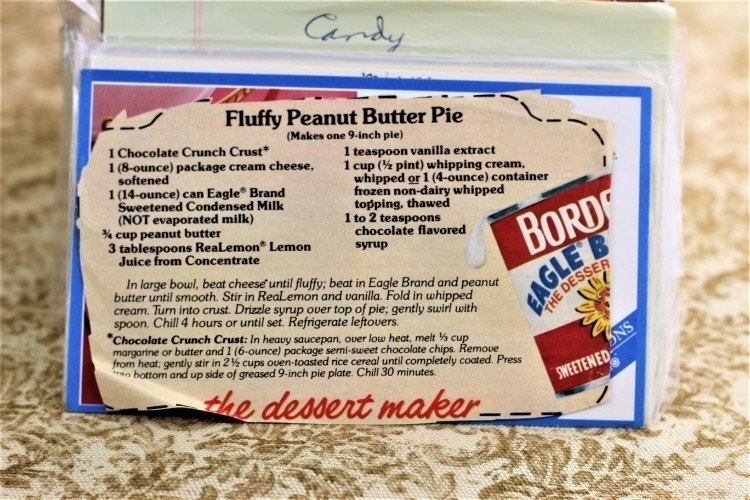 There are lots of fun recipes to read in the box this recipe for Fluffy Peanut Butter Pie was with. Use the links below to view other recipes similar to this Fluffy Peanut Butter Pie recipe. If you make this Fluffy Peanut Butter Pie recipe, please share your photos and comments below! In large bowl, beat cheese[*] until fluffy, beat in Eagle Brand and peanut butter until smooth. Stir in ReaLemon and vanilla. Drizzle syrup over top of pie; gently swirl with spoon. Chill 4 hours or until set. In heavy saucepan, over low heat, melt ⅓ cup margarine or butter and 1 (6-ounce) package semi-sweet chocolate chips. Remove from heat; gently stir in 2½ cups oven-toasted rice cereal completely coated. Press into bottom and up side of greased 9-inch pie plate.